In the small teams competition, Tolero Racing did very well, finishing 3rd out of 28 with 1031 points. Individually, Kimberly Lucie finished in 6th for Senior Women 1-2, Nate Davis was 11th in Senior Men 1, Adam Bryfogle took second in Mens 2 and Colton Keeler was 8th in Mens 4-5. Not a bad haul for the year – congrats to everyone involved! This entry was posted in Announcements, Results on November 8, 2014 by admin. Our host went MIA so we are rebuilding the site. Expect images and results to reappear soon. This entry was posted in Announcements on October 16, 2014 by admin. 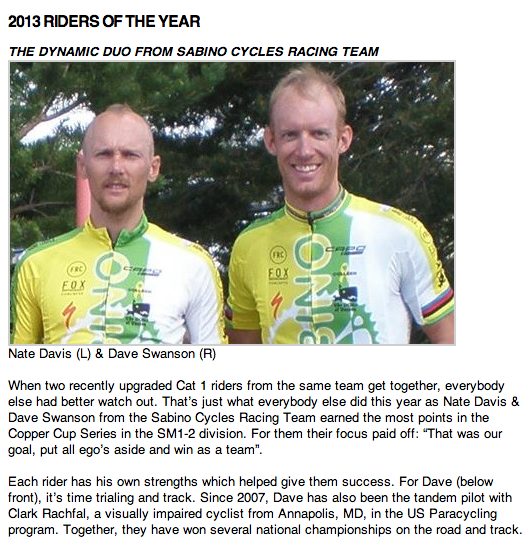 Kudos to THE Nate Davis for being co-winner of the 2013 Arizona Rider of the Year. This entry was posted in Announcements on January 16, 2014 by admin. 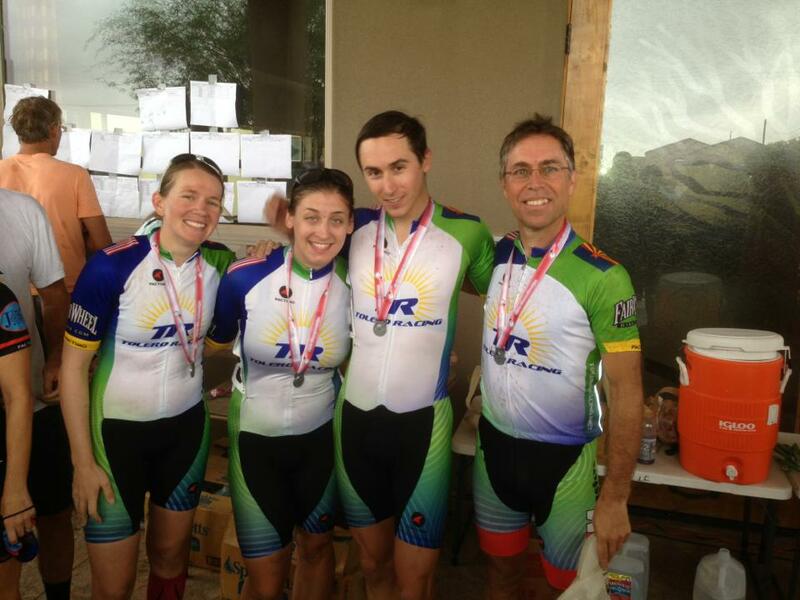 Tolero Racing Takes Second at the State TTT! Despite the pouring rain, the Coed Open team of Kim Beisner, Mike Cinalli, Andrea Gonzales, and John Hoffmann did the State Champ Team Time Trial! 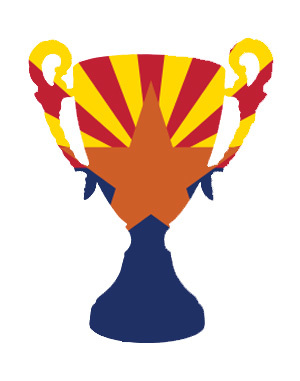 They took second place in their category, against opponents on Curbside, Two Wheel Jones, and TriSports. 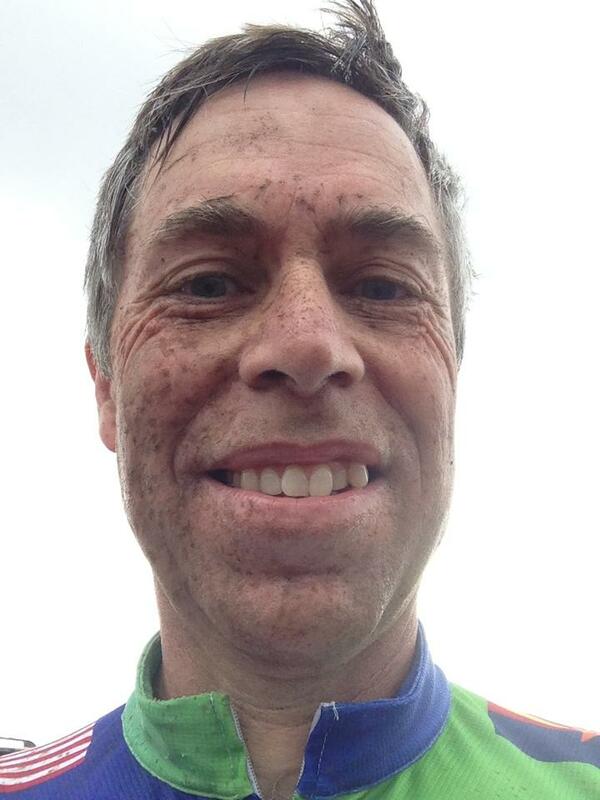 Even though they were soaked with water and covered in mud, it was a successful day for green! John shows off the mud on his face! Team photo! Great job, guys! This entry was posted in Announcements on September 14, 2013 by andrea gonzales.